On this day in 1787, in Philadelphia, the greatest document written in the last several centuries was completed. What began as a rewrite of the Articles of Confederation became the Constitution of the United States. 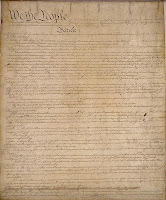 It's a document that guarantees our liberties. It lays out the duties and responsibilities of the three branches of our federal government, and it establishes the relationship between the states. And, as amended, it establishes the rights guaranteed to the individuals on which the government may not infringe. I am of the camp that feels that not enough people have read the Constitution -- including many who have sworn to uphold and defend the Constitution. At the conclusion of the Constitutional Convention, delegate Benjamin Franklin (the dude on the $100 bill, for you on the left) was asked, "What have we got—a Republic or a Monarchy?" To which Franklin replied, “A Republic, if you can keep it.” Go read the Constitution. Then make it your mission to help us keep a republic.